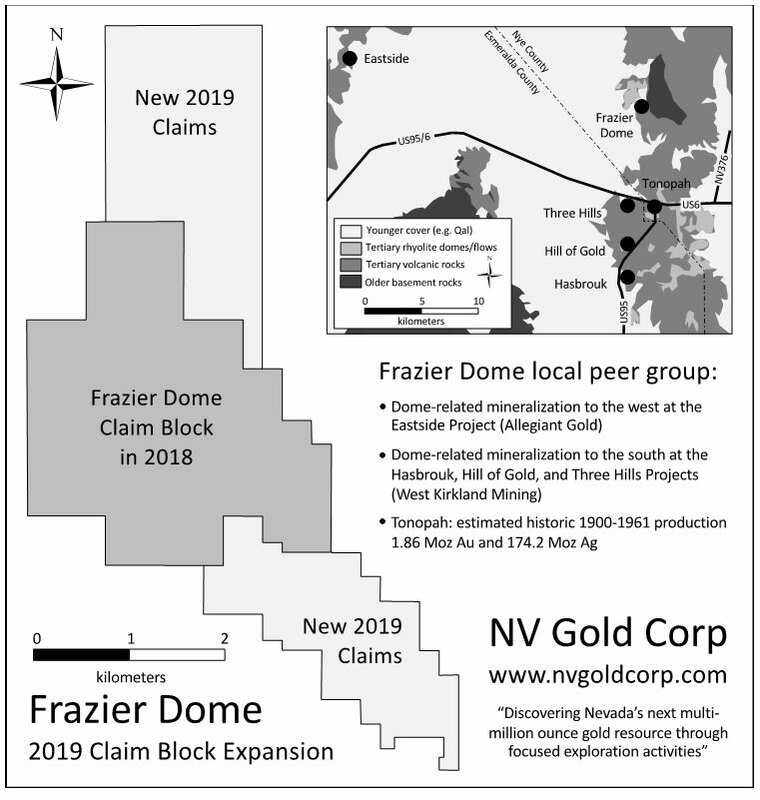 April 02, 2019 - Vancouver, British Columbia – NV Gold Corporation (TSXV: NVX; US: NVGLF) (“NV Gold” or the “Company”) announces the staking and approximate doubling of its land position around its 100% controlled Frazier Dome Gold Project, located in the Tonopah Mining District, Nevada, and highlights its upcoming 2019 exploration program. Gold occurs in silicified breccias adjacent to a Middle Miocene felsic dome, where Company surface samples grade up to 6.1 g/t Au over 3 m, and historical surface samples grade up to 14.7 g/t Au. High-grade gold also occurs in north-northwest-trending quartz veins, with Company surface samples grading up to 11.2 g/t Au, and a historical drill hole grading 7.5 g/t Au over 3 m.
2018 drilling (8 holes) yielded notable runs of detectable gold across altered and mineralized zones in FD-1: ~105 meters, FD-2: ~150 meters, and FD-5: ~135 meters. Re-surveying of hole FD-01 identified strong deviation of the drill hole, causing it to miss the priority target structure of the interpreted feeder zone beneath the identified rhyolite dome. 2018 drilling only tested 4 of 9 target areas, and only tested depths of 500 ft from the surface. Five of the eight widely-spaced holes delivered gold intersections greater than 0.10 g/t, and up to 1.035 g/t, pointing to what the Company believes could be a robust gold system at depth. Consolidate key property position in and around project. Completed in March 2019 by adding 71 claims (approx. 1466.9 acres) to the existing 72 claims (approx. 1,487.6 acres. Property position now totals approx. 2,954.5 acres (approx. 1,195.6 Hectares) – see attached map below. Focused mapping, sampling program and structural analysis in combination with geophysical program studies to define three-dimensional framework to enhance the quality of already known targets, and to identify new targets buried elsewhere on the property. 80 percent of the property is covered by post-mineral volcanic rocks and alluvium, and five of the original nine targets permitted remain untested. Follow-up deeper holes are also being planned for the targets already tested. Given the exposed widths and lengths identified in 2018, and with the estimated depths and calculated volumes, the Company believes it is possible for a robust gold deposit to occur deeper on the claim block. The Frazier Dome Project, staked by the Company, is located 13 km north of the Tonopah Mining District, Nye County, Nevada. The Project contains a low- to intermediate-sulfidation, volcanic-hosted epithermal gold system with high-grade mineralization. Dr. Michael Gustin of Mine Development Associates, an independent Qualified Person under NI 43-101, has reviewed and approved the technical information disclosed in this release. Mine Development Associates is a division of RESPEC.